NutriSource® Senior and Wt. Mgmt Cat is specifically formulated for heavier more mature cats. 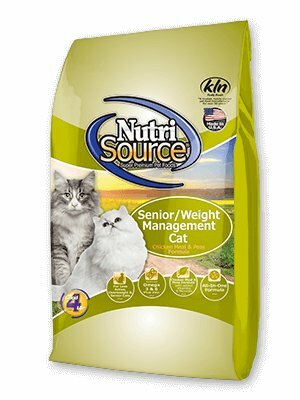 NutriSource® Senior/Wt. Mgmt Chicken and Rice formula delivers super premium nutrition in a holistically formulated, easy-to-digest food. We combine Low-ash chicken meal, USA grown brown rice with carefully selected holistic ingredients to promote balanced growth and unparalleled health for your friendly feline. Health of your beloved pet is our #1 priority and our unmatched use of Alltech Good 4 life supplements guarantees you won't have any litterbox issues and a you'll create a healthier immune system, we guarantee it. Bio-availability is important to your pets long-term health so we created a highly digestible, nutrient dense morsel with +90% digestibility rating. With NutriSource® you can feed less and get more nutrition - Health does start here! Chicken meal, peas, pea fiber, barley, oatmeal, natural flavor, beet pulp-dried, fish meal, chicken fat (preserved with mixed tocopherols and citric acid), yeast extract, dried brewers yeast, alfalfa meal, dried tomato pomace, phosphoric acid, flax seed, potassium chloride, salt, sunflower oil, DL methionine, dried egg product, minerals (iron proteinate, zinc proteinate, copper proteinate, manganese proteinate, cobalt proteinate), choline chloride, cranberry powder, vitamins (vitamin A acetate, vitamin D3 supplement, vitamin E supplement, niacin, d-calcium pantothenate, thiamine mononitrate, riboflavin supplement, pyridoxine hydrochloride, folic acid, biotin, vitamin B12 supplement), chicory extract, lactic acid, taurine, inositol, L-ascorbyl-2-polyphosphate, yucca schidigera extract, ascorbic acid (source of vitamin C), calcium iodate, sodium selenite, rosemary extract, yeast culture (Saccharomyces cerevisiae), dried Lactobacillus acidophilus fermentation product, dried Enterococcus faecium fermentation product, dried Aspergillus niger fermentation extract, dried Trichoderma longibrachiatum fermentation extract, dried Bacillus subtilis fermentation extract.